The world famous Blue Angels were doing a practice run for the Star-Spangled Sailabration June 14 over Baltimore’s skyline. The Sailabration, which is taking place June 13-19, will feature tall ships and naval vessels in Baltimore’s Inner Harbor as the city marks the Bicentennial of the War of 1812. 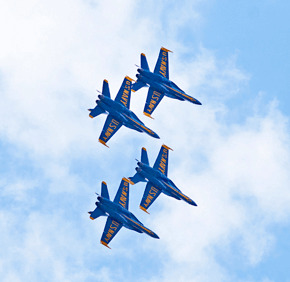 The Blue Angels, a flight demonstration squadron of the U.S. Navy featuring F/A-18 Hornet jets, will take part in 45-minute presentation during the Sailabration June 16-17. It is the first time Baltimore has ever hosted an air show.